We visit Viome, Greece’s only worker-managed factory. It was a hot July morning and there was no electricity at Viome, Greece’s only worker-managed factory. I had come to the outskirts of Thessaloniki, Greece’s second-largest town, to see the plant first-hand roughly five years after the takeover. By the time I arrived, the morning worker assembly was over, and half a dozen people roamed around clutching glasses of frappe, the omnipresent cold instant coffee. Sudden electricity cuts are frequent, and without power there wasn’t much to do. Still, no one thought of going home: someone has to be present at all times, since there is always risk of eviction. In February 2013, some of these workers had broken into the then-abandoned factory, followed by TV cameras and activists. The occupation of a shuttered factory was a novelty in the crisis-ridden country, and particularly in a region marked by slow but steady deindustrialization: 25 percent of all factories in the Thessaloniki area had shut down and almost a third of its one million population was unemployed. The workers of Viome — an abbreviation for Viomichaniki Metaleutiki, or Industrial Minerals — had been jobless for around two years, and were by then involved in a lawsuit against Viome’s parent company, the Greek ceramic-tile multinational Philkeram Johnson. Philkeram, which declared bankruptcy in 2011, simply abandoned Viome, once a highly profitable producer of industrial adhesives and other construction materials. Its seventy employees hadn’t been paid for months, and they weren’t laid off either, so they couldn’t enjoy unemployment benefits. Amid a legal battle, a group of union members decided to take over the factory. They claimed they could take matters into their own hands and resume production in a self-managed way. News of massive layoffs were usually met with resignation, so the Viome struggle quickly gained momentum in left-wing circles. Still, their long-term strategy was riddled with thorny questions about ownership —they didn’t, and still don’t, hold legal ownership of the factory. There was also the small issue of survival in a competitive capitalist environment. Odds were stacked against them. Factory takeovers weren’t common in Greece — most of Viome’s workers hadn’t even heard of the concept of self management. They had a reference in Argentina’s movement of fábricas tomadas, but no one had ever tried this in their country. “They watched some documentaries and read some articles,” said Spyros Gouras, a worker who joined Viome two years ago. The Solidarity Movement, an activist network to which Gouras belonged, helped Viome organize rallies and concerts to fundraise the costs of the takeover. These five years weren’t an easy ride. During the first months of the occupation, Viome’s workers had to redefine the whole concept of work. Former machine operators had to learn about strategy, management, sales, and assembly-based democracy. A 2015 documentary about Viome, Next Stop Utopia, offers a glimpse into those early struggles: tensions ran high in the worker assembly, and every decision entailed endless rounds of heated discussions. In one particular meeting, they argued whether they should forbid using the first-person singular and employ always the communal “we.” Other issues were more practical: they had to establish what they were going to produce, since the expensive raw materials the old Viome required were out of reach. Eventually, they settled on natural liquid detergents and hand-soap bars, which they started manufacturing through a painstaking trial-and-error process. Over time, Viome managed to forge a nationwide solidarity network of spaces willing to sell their output. This network, which included eco-shops, local citizens associations, unions, and other worker co-ops, has been critical to their survival. Eventually, it expanded to other European countries, which allowed them to raise their profit margins. On the ground, however, Viome’s achievements look fragile, and the factory faces some daunting challenges. The most pressing is the issue of ownership. The workers are occupying only one-sixth of Philkeram’s old industrial compound, and have tried to obtain legal property rights from the beginning. But the company’s liquidation group decided to auction it as a block, which drastically reduces their chances of holding on. So far, economic stagnation has played in their favor; but as time goes by and prices drop, the chances of finding buyers increase. Makis Anagnostou, a twenty-year veteran of Viome, was weary when talking about the future. On that July morning, he was revising stacks of hand soap and detergents piled high in the somber warehouse. From the beginning, Anagnostou was a die-hard advocate of taking over the plant and establishing workplace democracy. He said the hardest part were the two years before breaking in, when their multiple lawsuits against Philkeram were ongoing and they had zero income. One of their biggest achievements has been securing a wage for all Viome workers, however low, that comes entirely from their sales. The issue of ownership has been at the core of every factory takeover attempted under capitalism. During Argentina’s 2001 economic crisis, the state partly gave into the worker’s demands with the condition that the workplaces had to become co-ops. Similarly, the former Greek government lead by the conservative Antoni Samaras told Viome that forming a legal cooperative would improve their chances of gaining legal hold of the plant. They finally did so in April 2014, even though the decision was highly divisive and lead to thirteen workers walking out. In the end it didn’t change anything — the co-op has kept on operating in an occupied space, with workers organizing night shifts and concealing their products in fear of potential police raids. The Syriza electoral victory in September 2015 gave Viome a glimmer of hope. New president Alexis Tsipras had visited the factory as an opposition leader, and promised to advance legislation what would allow factory workers to legally run their shuttered plants. The initial expectation was followed by disappointment as Tsipras failed to materialize any of his promises. However, “going legal” entailed new opportunities. The main one was the possibility to legally export to the European Union. Exports to Germany, Switzerland, Austria, and the Netherlands provide Viome’s main source of revenue today. Agreements are being sought to export to countries outside the EU such as Turkey and the Republic of Macedonia. Their clients abroad are an international solidarity network that includes other self-managed factories, such as the former Lipton plant in Marseille. In Greece though, no other factories have followed suit, which partly undermines the initial cause of Viome of moving towards a broad worker-controlled economy. The government’s unwillingness to favor Viome has discouraged others to undertake similar experiments. Besides, self management requires a high personal commitment, including the active participation in daily assemblies and the ability to endure uncertainty. A degree of economic independence is also necessary: the 2.30 euro/hour wage the Viome’s workers receive is barely above the unemployment benefit. In reality, this means that many need to take on other part-time jobs or rely on the work of spouses and relatives to support themselves and their families. The flip side for Viome’s twenty-three workers is getting to work in an environment that gives people a sense of self-worth. “I am happy here, when I’m coming to my job. I had never been happy going to a job,” said Fotini Baltzoi, a former hotel clerk who joined Viome in 2016 to manage the accounting and online sales. As every new Viome worker, Baltzoi went through a three-month testing period, during which she got accustomed to participating in the daily assemblies. Baltzoi acknowledged the uncertainty of the near future, with the looming auctions and the fact that the takeover movement is not expanding in Greece. She attributed the latter to the role of the unions, which in the case of Viome was critical: its union was independent from the main Philkeram workers association and decided to move forward with the takeover independently. 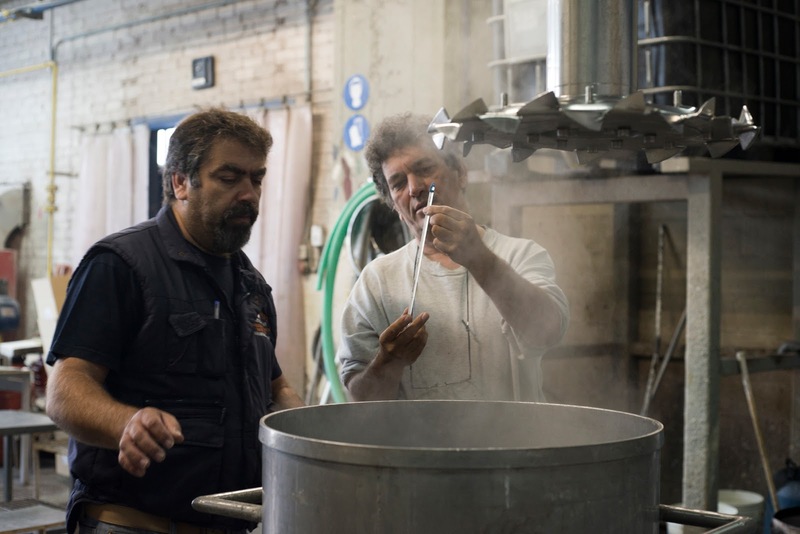 Viome is the only self-managed factory in Greece, but it exists within a nationwide movement of cooperatives that expanded after the outbreak of the crisis. Draconian austerity measures, along with a 20 percent unemployment rate, left many people on the fringes, unable to make a living and access basic needs. As a consequence, self-managed initiatives and workers co-ops emerged in the fields of health care, clothing, food production, and others. Some were an outright response to the government’s failure to fund basic services. A good example is the self-managed Metropolitan Community Clinic at Helliniko, in Athens, which from 2011 to 2018 provided free health care to thousands of Greeks for whom public hospitals and medication had become unaffordable. The Metropolitan Community Clinic was part of a network of solidarity clinics and pharmacies operating across Greece, generally organized at a local community level and under the direction of the members’ general assembly. Thessaloniki has a similar organization, the Workers Health Care Center, which offers holistic health care to working-class Greeks and has its base office inside of the Viome compound. For a short while, the occupation of Viome inspired similar initiatives in the area; when the Samaras government announced the shutdown of ERT, Greece’s public radio-TV station, in June 2013, some of its employees refused to comply and kept on broadcasting in a self-organized manner. Thessaloniki’s ERT building remained occupied until the government reopened the station in 2015. As I was leaving the factory that Monday in July, the electricity suddenly came back to Viome, and a minute later everyone went back to work. Anna Pazos is a freelance journalist currently based in New York.